I chose this image taken by Marcus Ranum and found on DeviantArt. Firstly I cropped the image to a composition that I like and then make it monochrome so that I could see the values in it. After laying down the line art I added tape to the top and bottom so that I would have a clean edge after I added colour. Next I put in the shadows, but too lightly. Historically I’ve always been a little shy with going dark in my work, and honestly I should have pushed this a lot more in hindsight. Next I worked in the colour. Unfortunately I went too heavy with the ochre initially and I was very frustrated with the Mitsubishi’s lack of skin tones. Eventually I put the work on hold and ordered a few Caran d’Arche pencils in the colours I felt I needed. I never quite managed to recover from the over use of ochre in the under layer though. Once I felt it was done, I went over it all with a blender pencil (this is something new for me). I was quite pleased at the lovely gloss it gave to the image and though it did help with some blending I was, perhaps, expecting a little too much from it. I had a very hard time resisting the urge to take water to the lot and turn it into a watercolour painting instead. 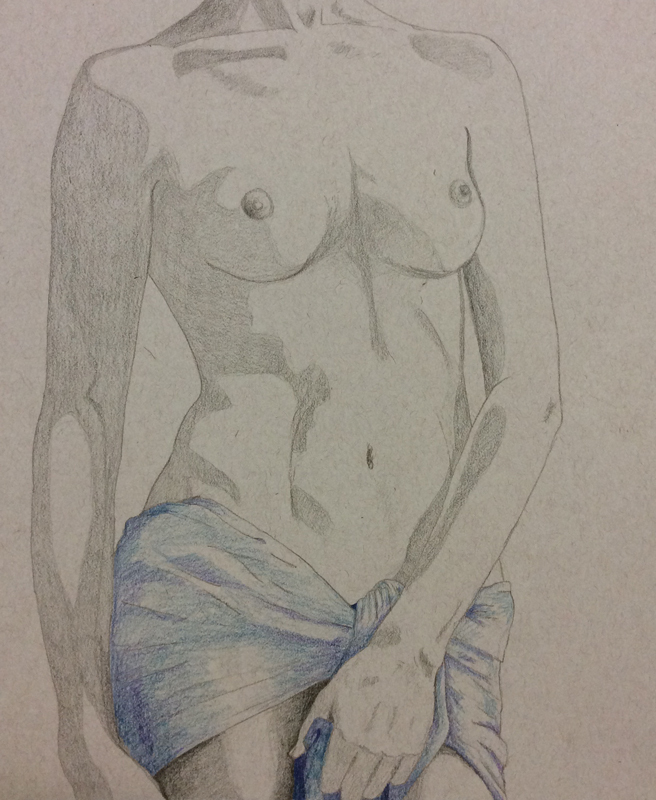 All in all it was an interesting learning experience, both to work with the subject and working on toned paper. Final scan with tape removed.